Maybe Underworld Coinsmith or Carnage Gladiator for the incremental damage? Bluemechanic Crackling Doom seems spicy, thanks for the tip! 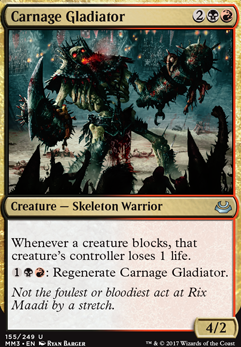 Carnage Gladiator is a pet card that's most likely first to go, but it hasn't seen play yet. Sunscorch Regent is the same case but it tends to grow quite nicely. The7thBobba on Take your diaper off and put your helmet on! 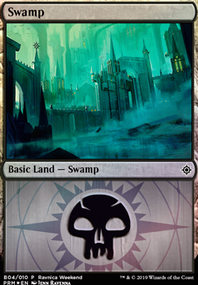 well, i'm looking at the deck and i'm sorry to say that there is no way to make this deck viable in legacy without extreme overhaul to the point that it would be unrecognizable. however, there are only 6 cards in here that are not modern legal (3 Dark Ritual and 3 Malicious Affliction). I will attempt to give you advise for a scenario where you move this over to modern, and for if you intend to stick to legacy. so this post will be long. first off modern because it will involve "less" alterations. first cut the 6 cards i mentioned as they wouldnt be legal. starting from the top Nefarox, Overlord of Grixis should be cut as he is too slow, and provides little value when he enters. for a six drop in modern you need extreme value. Ob Nixilis, Unshackled should be cut for the same reason. Haunting Echoes does absolutely nothing to help your goals in this deck. your opponent may have a creature or two that they blocked yours with or maybe some fetches and a removal spell, but likely they will only have 3-5 cards in the grave. this card will exile fetches mostly which will only serve to help them remove dead draws since at the point in the game where you play Haunting Echoes your opponent will have enough mana to do whatever they please. cut them. Archfiend of Depravity is a big flier with an effect that can really control the board, but i think there are a few other 5 drops you'd rather play (or not play and fill up on 4 drop threats which black is loaded with), so for those reasons i'd cut these as well. Master of Cruelties: interesting card for sure. a very serious threat on offense or defense. sadly it's pretty high on the curve for a card that's usefulness is stopped by 1/1s. your deck will probably want to be more aggressive than this card lets you be. so for that reason i'd cut him. time for 4 drops and lower. 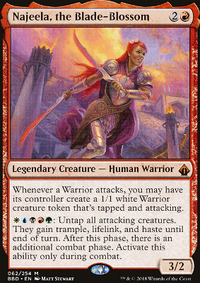 Exava, Rakdos Blood Witch is good when you have lots of creatures with +1/+1 counters the turn they enter (her ability is useless for Desecration Demon. currently you have 7 (10 if you count the megamorph option on Silumgar Assassin which would only count if you play it face down and flip it the same turn). 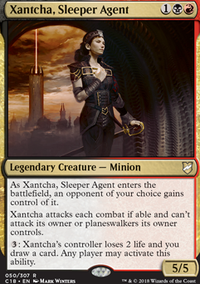 all of these creatures are expected to come down much earlier than her, and wouldn't provide much value if played after her because of their small size, regardless of haste. 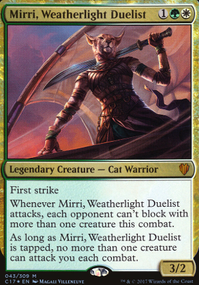 so i'd cut her for a more efficient 4 drop. Desecration Demon: decent card depending on the scenario, but you're leaving yourself open to tempo loss. if you opponent has a few disposable creatures then you probably spent 4 mana and a card to do nothing. however if you can control the board with well placed removal, your opponent will be forced to make some tough choices. basically i'd say this guy is bad in the current deck but will be much better with more removal (which will be discussed later). 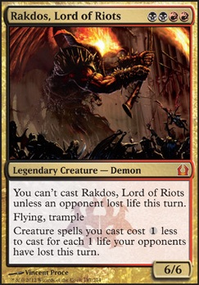 Rakdos, Lord of Riots: great body with evasion and trample for when he can't evade blockers. great body. the mana cost is restrictive, but with a better mana base you will be able to cast him easier. the damage condition hopefully wont be terribly difficult for a deck that plays red. the second effect is something you shouldn't ever expect or rely on, but will be nice to have when it happens. Hellhole Flailer isn't very good for it's mana cost. you could be playing cards with better stats for the same cost Ashenmoor Gouger. yes it can't be sacrificed, but it can't be Lightning Bolted either. or Shambling Remains which is basically Hellhole Flailer that can be brought back for another swing if needed. there are also other cards like Anathemancer which will enter and probably deal 3-4 damage to the opponent and still leave a 2/2 body. Olivia, Mobilized for War basically as a 3/3 flyer for 3 with an optional effect that can be relevant in some cases. Spike Jester is an aggressive card for this aggressive deck. might be slightly outclassed by other 2 drops. keep at your own discretion. Silumgar Assassin is a bad card for a bad scenario. it's ability is only relevant when your opponent has bigger creatures than you, in which case you swinging for 2 unblockable won't matter much when their Tarmogoyf hits back for 6. cut this. Devour in Shadow: red and black are the two colors with the most removal in pretty much every format. this card is outclassed by its competitors like Terminate and Lightning Bolt and Grasp of Darkness and Dismember and Victim of Night (this one is more for mono-black but still possible), Ultimate Price...etc etc etc. cut this. it will be replaced with better removal. Rakdos Cackler: aggressive 1 drop on a budget does exactly what it needs to do. ok so thats 25 cards removed. now what to add back in. you need more low drop threats to pressure your opponent. Monastery Swiftspear is good if we add more instants and sorceries, but i think this will end up as a creature heavy deck. you can play Zurgo Bellstriker as a 2 of. he is basically a better cackler. but only 2 since he is legendary. Bloodsoaked Champion is good if you plan on winning with many smaller attackers, but it looks like you'd prefer a more midrangy plan with bigger beaters. so i think for now you can just add 2 zurgos for 1 drops. but i don't think you need a lot of these. for 2 drops you have lots of options. Battle Brawler is a 2 mana 3/2 first strike most of the time. Burning-Tree Emissary can help you with a going wide strategy, as it refunds itself. its a little hard to get the double red on turn 2. but it will refund a red and an extra to play any other red two drops you have. or it can be held for latter to basically play for free before you cast another creature. but it's much harder to optimally use without green. 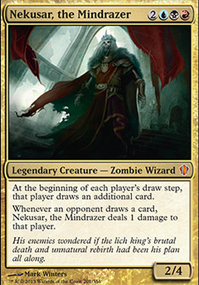 Eidolon of the Great Revel is a bit pricey, but is a great addition to your deck. especially since you will be able to grind out your opponent who will probably have more cards with cmc 3 or less compared to you. 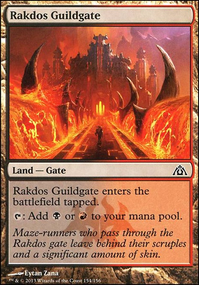 if you end up in heavy black Gatekeeper of Malakir is great (but usually held back until turn 3 for the kicker). Goblin Deathraiders is a good card that can replace Spike Jester if you want to try going over your opponents creatures. might be better with the midrange style of your deck (slightly slower and more big creatures). Scrapheap Scrounger is a new card that could have some potential here. Grixis Grimblade is good if other multicolored enchantments are added. 4 drops that warrant attention: Ashenmoor Liege is a great way to buff your entire team and it will cost your opponent 4 life to remove it which is decent value, Carnage Gladiator makes blocking decisions much harder, Mogis, God of Slaughter will be turned on fairly easily with lots of the creatures already mentioned that are highly saturated colorwise. theres also the cards that we didnt cut from the deck. removal that you should consider: Lightning Bolt this card should go in. this one isnt really a suggestion. this is more of a necessity. Terminate is great and will really help you out. basically anything i mentioned earlier. other supporting cards that could help you out would be a discard suite. land base could be really upped but not without straining budget. 4 Dragonskull Summits would help. 4 Bloodfell Caves would also make things slightly better. for the advice on legacy, i'll be blunt. there is no way to conceivably make this deck legacy viable and still have it look even remotely like the current deck. 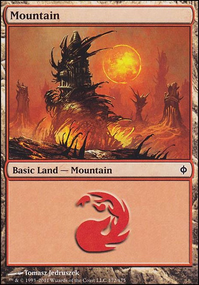 the only cards that i would keep in a legacy version of this deck would probably be 4 basic mountains and 3 basic swamps. at most.